I should really pay more attention to what I read. I saw More than Words having a lovely challenge this month - the word Moment and picture of clock has to be included. ...but... the challenge is not open for ATC cards. 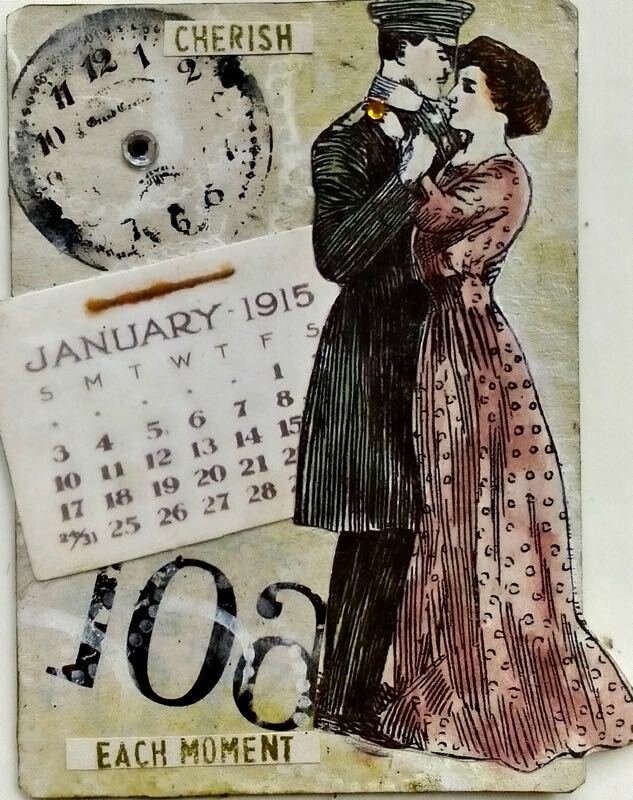 But never mind, it got my creative juices flowing and I spun a whole story of a couple who get engaged in the midst of WW1. The man is an officer, he has to return to the front, so they promise each other to cherish each moment when they are together. But for all we know there was no happy ending, he leaves for the front never to return. Double lesson learned: DO cherish each moment for it may well be the last of that kind. I am celebrating some small victories here: finally I managed to get some nice transfers. 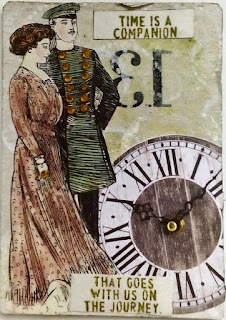 They are: numbers on first and last card, clock (without hands!) on the last card. Those were made with Modge Podge. Thanks for the tip, that really worked well. The middle card is made with that other stuff expressly called transfer glue. It leaves a shiny residue which is not always called for. And for that card I printed out the sentiment in the reverse so it appears right, for the numbers I didn't as they should portray the wish of the lady that time might go backwards. Also the clock without hands is used for the same reason. Creative Corner: Hit the books - I used illustrations from a Victorian novel I bought on the flea market, then colored them in. 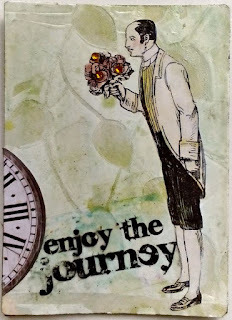 Simon says Wednesday challenge: Stencil it - the backgrounds are stenciled, best seen on the Butler card in the middle. Näihin kortteihin on taas käytetty KK:n kiertävästä materiaalikuoresta tulleita Timantteja. En niitä juurikaan harrasta, joten pitipä kokeilla. Sainkin miehen takkiin aika komean rivin kiiltäviä nappeja, kukkakimppuun on piilotettu myös muutama sekä naisen kihlajaissormuksessa on aika iso kiiltävä kivi. Ompa taas ihana sarja! Mykistävä suorastaan..
A wonderful and romantic trio of ATC's ! Just beautiful with the love story! Thank you for sharing it with us at Moo Mania & More ! Mahtavat! Niin paljon mielenkiintoisia teknikoita on käytetty ja taas on kiinnostava tarina! What fabulous ATC! You do great work on such a small surface! Thank you for your visit to my blog and your sweet comment on my gears and umbrella man card. To answer your question: you could probably skip the glue step and get very similar results, but in this case the glue acted as a resist to the many, many layers following. I didn't follow any particular recipe, but just kept trying different things until I was happy! Hope that helps; just have fun and experiment! Thank you Sara! Yes, I was wondering about the glue. I thought it might have no effect if o much was piled on it. But it's good to know it does have a purpose. Completely agree - cherish each moment. What a beautiful romantic story for your LOVELY vintage creations Alice. They are all very special. What a neat calendar with a bit of rust on it too!! And the clocks turned out so nice. It's wonderful to see you at Our Creative Corner for the 'Hit the Books' Challenge. j.
awesome ATC cards!! :) thank you for playing along with us at simon says stamp wednesday challenge!!! Upeita kortteja. Kiva kun lähdit mukaan.